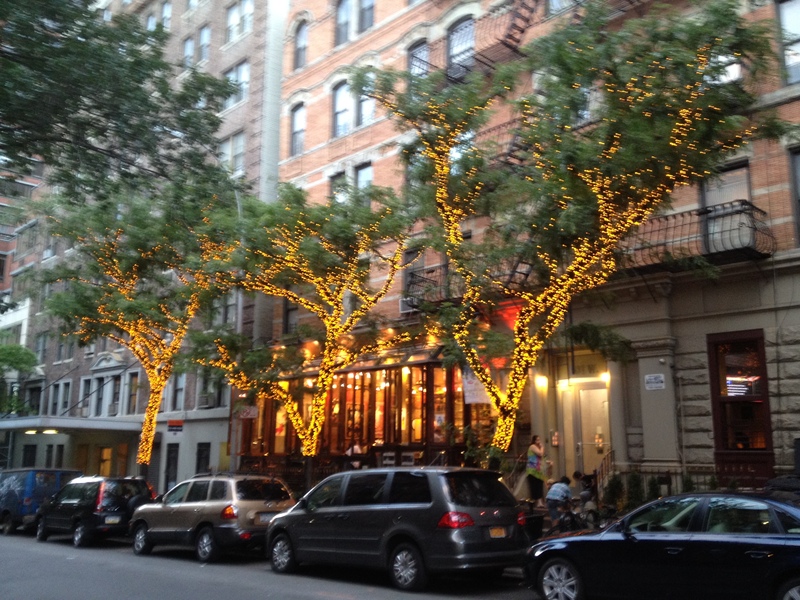 Last Tuesday after I finished setting up for a video shoot on the Upper West Side of Manhattan I walked past a restaurant on 83rd Street and took a quick iPhone photo of restaurant that caught my eye because of the lights on the trees. Only later did I learn that just a couple of miles away on the Upper East Side, and just an hour earlier, writer/director Nora Ephron had died. And the restaurant, the Cafe Lalo, just happened to be where one of the scenes from Ephron’s movie You’ve Got Mail was shot. A serendipitous moment of fate that characterized much of Ephron’s work. Including her best known scripts When Harry Met Sally… (1989), Sleepless in Seattle (1993), and You’ve Got Mail (1998). A most incredible ten year run by the way. According to Box Office Mojo, movies from scripts she worked on grossed over $700 million. Her screenwriter parents Henry & Phobe Ephron were two of the writers on the WGA-nominated Carousel and the Oscar-nomimated Captain Newman, M.D. (1963). At the time of her death, Nora was married to screenwriter Nicholas Pileggi who (along with Martin Scorsese) won an Oscar for writing Goodfellas. And she wrote You’ve Got Mail with her sister Delia. That’s a lot of talent connected to one family. She grew up an avid reader and graduated from Beverly Hills High School, and later Wellesley College. She had an internship at the White House with Pierre Salinger, who was the Press Secretary for President John F. Kennedy. When the bumpy ride was over in the early 80s she was a screenwriter. Though she had sold scripts and had some TV work produced, Ephron was over forty when her first feature was produced. I was in film school when I saw that film Silkwood (1983). It was powerful stuff, and much more serious drama than what she is known for now. She and co-writer Alice Arlen were nominated for an Oscar for the script. Over the years Ephron was nominated three times for scripts she worked on. Silkwood was directed by Mike Nichols (The Graduate) who taught Ephron a lot about writing. Though journalism jobs are harder to come by these days, Ephron spoke of writing 4 or 5 years of journalistic stories about how people live their lives as great preparation for being a screenwriter. And writing a blog called Screenwriting from Iowa, I would be remiss if I didn’t mention that Ephron directed John Travolta, Andie MacDowell, and William Hurt in Michael (1996) which was shot in Iowa. P.S. Nora Ephron’s 2010 New Yorker essay My Life As An Heiress is a good read on why having more money won’t make you a better writer. Scott, thank you for your Nora Ephron tribute. And how uncanny that you took the photo of the cafe where a scene from You’ve Got Mail was filmed just before you learned Ephron had died. The scene is great; the lights on the trees are beautiful. Just watched “You’ve Got Mail” for the first time in many years and didn’t realize that the entire story plays out on the Upper West Side of town. That movie–that scene—shows what a gifted writer and director she was. “You’ve Got Mail” is my feel good movie, so I often have it saved on my DVR in case I’m in need of a little pick-me-up. Only in recent years did I realize it was a remake of “The Shop Around the Corner.” Excellent post, Scott – you are a talented writer!